Welcome to the Honda Grom Forum. Want to show off some new pictures/videos of the Honda Grom? All Honda Grom media can be posted in here. Honda Grom events, clubs, rides, meets and more. 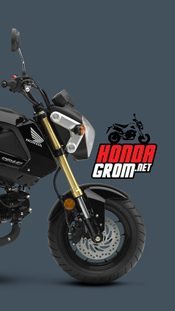 This section contains How-To's and Guides for the Honda Grom and Honda MSX125. Post your Honda Grom first ride impressions andHonda Grom reviews here! Discuss Grom / MSX125 Gear and Grom / MSX125 Accessories. Ready to turn your Grom / MSX125 into a real Road Monster or just looking to pump out a few extra HPs? Discuss it here! Discussions for Honda Grom / Honda MSX125 Wheels & Tires. If you are looking to pick up a Grom (or MSX125) -- or are looking for one in particular, post in here. Full bikes only. Parts belong in the parts area. If you are looking to pick up Grom Parts/Accessories (or MSX125) -- or are looking for parts in particular, post in here. Want to talk about a particular vendor you did business with? Want to let the community know about good places to buy parts or special deals? Post it up in here. Independent third party posts, no one associated with businesses can create threads in here. No shills allowed! Buy/Sell something from a member of the forum? Let us know how it went.
. Thanks run ;-) . Nice touch. :) The Monkey fork guards are perfect for a dual sport. I put a low front fender on mine, but they also mount high same as on the Monkey. I'd say if it has worked for the past three years you should be good.